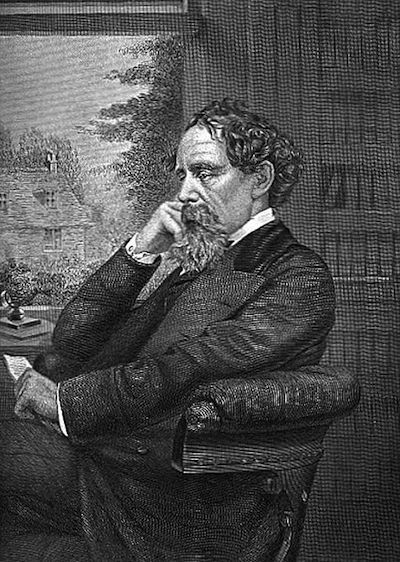 Rising from a difficult childhood, Charles Dickens became one of the world's most famous writers. With the difficult experiences of his childhood in mind, he was also a prominent social critic and used his fiction to illuminate many of the social problems of his times. Dickens described his first eleven years as idyllic, but his father's bankruptcy brought a swift end to those days. When Dickens was twelve years old, his father was thrown into debtor's prison; and, as was customary for the times, his family joined him. He was soon boarded with a family acquaintance and found himself working ten hours a day, under cruel conditions, in a blacking factory where he was set to the task of pasting labels to pots of boot polish. "My work was to cover the pots of paste-blacking; first with a piece of oil-paper, and then with a piece of blue paper; to tie them round with a string; and then to clip the paper close and neat, all round, until it looked as smart as a pot of ointment from an apothecary's shop. When a certain number of grosses of pots had attained this pitch of perfection, I was to paste on each a printed label, and then go on again with more pots. Two or three other boys were kept at similar duty down-stairs on similar wages. One of them came up, in a ragged apron and a paper cap, on the first Monday morning, to show me the trick of using the string and tying the knot. His name was Bob Fagin; and I took the liberty of using his name, long afterwards, in Oliver Twist." Coming up through school, I was always happy to learn that we would be reading a Dicken's novel in one of my classes. In the United States we often segregate classes by ability in middle school and high school. As a result the advanced readers in the same grade would sometimes read different books by the same author. While my class was assigned Great Expectations the other class was reading David Copperfield . As a result, there were several works that I "skipped" because they were not assigned in my class. When I was older I sought to remedy the situation and started to read the books that I had missed while in school. After my first brush with it at Christmas time one year, It became my habit to re-read David Copperfield every Christmas. I probably kept to that custom up for the better half of a decade. If you "missed" some of works in school as well, I hope you will follow my lead and investigate them now.